This entry was posted in Church of the Good Shepherd (Kensington) and tagged Alex N. Keedwell, Charles B. DuBell, Church News of the Diocese of Pennsylvania, Edward Ritchie, Francis B. Roseboro, Francis Marion Taitt, John A. Goodfellow, Kensington on December 30, 2015 by mjk38. 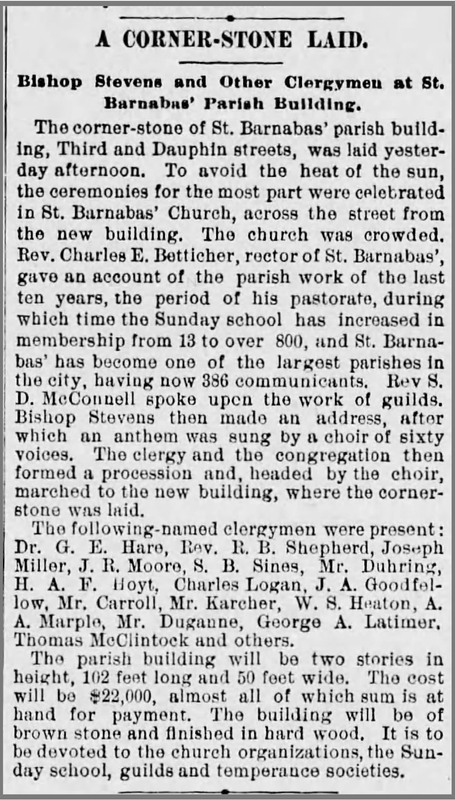 This entry was posted in St. Barnabas Church (Kensington) and tagged A. Augustus Marple, Charles Logan, G. Emlen Hare, George A. Latimer, Henry A. F. Hoyt, Herman L. Duhring, John A. Goodfellow, Joseph Miller, Joseph Roberts Moore, Kensington, Philadelphia Times, R. Bowden Shepherd, Snyder B. Simes, Thomas McClintock, William Bacon Stevens, William S. Heaton on November 2, 2015 by mjk38. 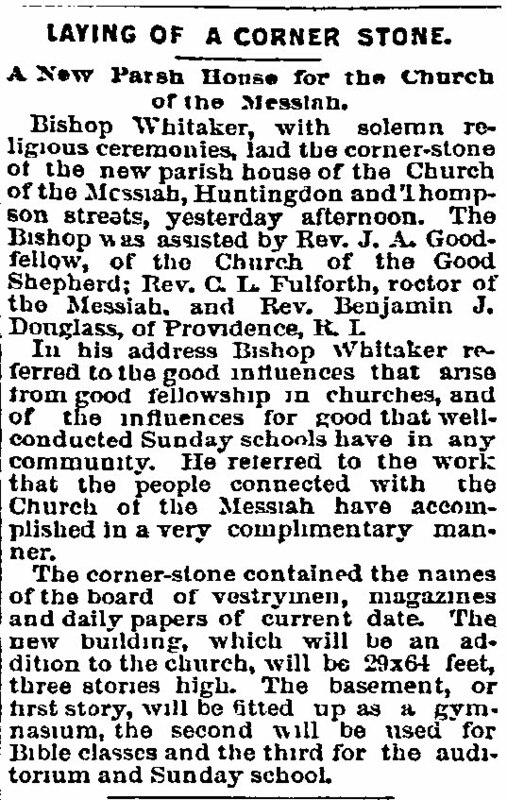 This entry was posted in African Episcopal Church of St. Thomas and tagged African-Americans, Center City, Francis Marion Taitt, Horace F. Fuller, John A. Goodfellow, John Pallam Williams, Ozi W. Whittaker, Philadelphia Times on October 18, 2015 by mjk38. This entry was posted in Church of the Messiah (Richmond) and tagged Charles Lockwood Fulforth, John A. Goodfellow, Ozi W. Whittaker, Philadelphia Inquirer, Port Richmond on October 3, 2015 by mjk38. This entry was posted in Church of the Good Shepherd (Kensington) and tagged John A. Goodfellow, Kensington, Ozi W. Whittaker, Philadelphia Times on October 2, 2015 by mjk38. 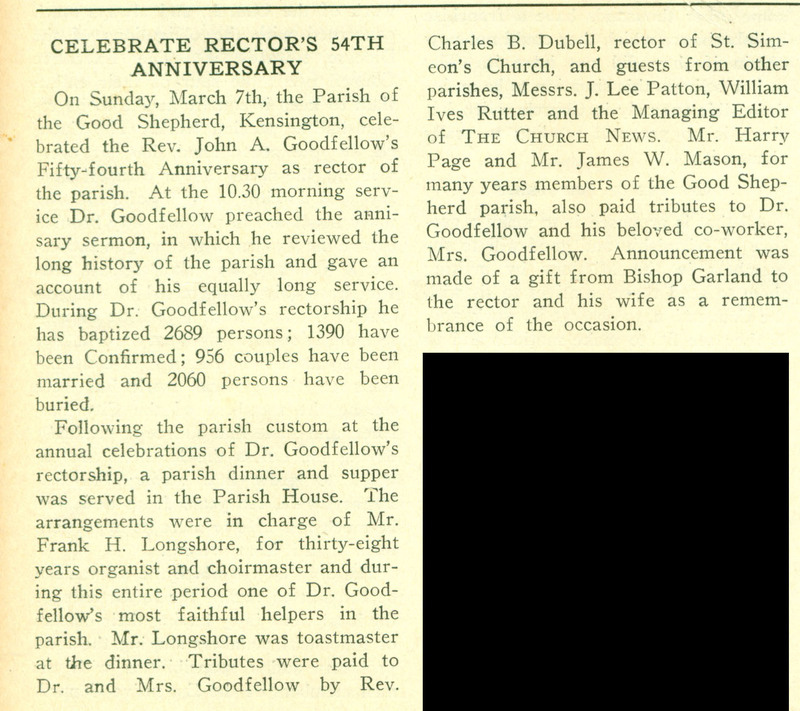 This entry was posted in Church of the Good Shepherd (Kensington) and tagged Church News of the Diocese of Pennsylvania, Frank H. Longshore, John A. Goodfellow, Kensington, North Philadelphia on April 22, 2015 by mjk38. 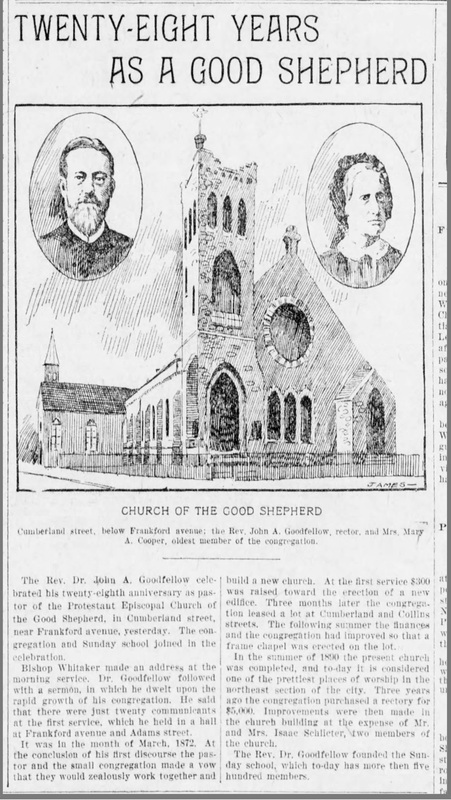 This entry was posted in Church of the Good Shepherd (Kensington) and tagged Church News of the Diocese of Pennsylvania, John A. Goodfellow, Kensington on April 21, 2015 by mjk38. 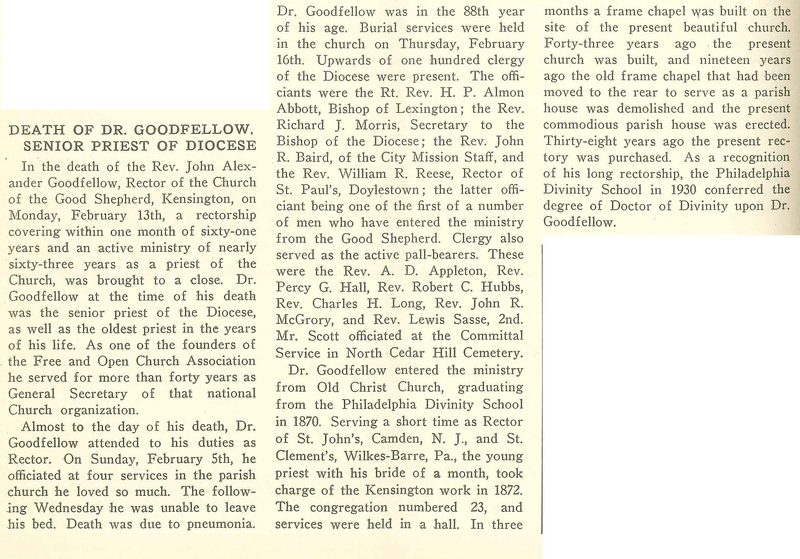 This entry was posted in Church of the Good Shepherd (Kensington) and tagged Church News of the Diocese of Pennsylvania, John A. Goodfellow, Kensington on April 16, 2015 by mjk38. Found in the archives of St. Mary’s Church, Hamilton Village. Click on the image to access the report. This entry was posted in Church of the Good Shepherd (Kensington), St. Mary's Church (Hamilton Village) and tagged Free and Open Church Association, John A. Goodfellow on March 21, 2015 by mjk38.